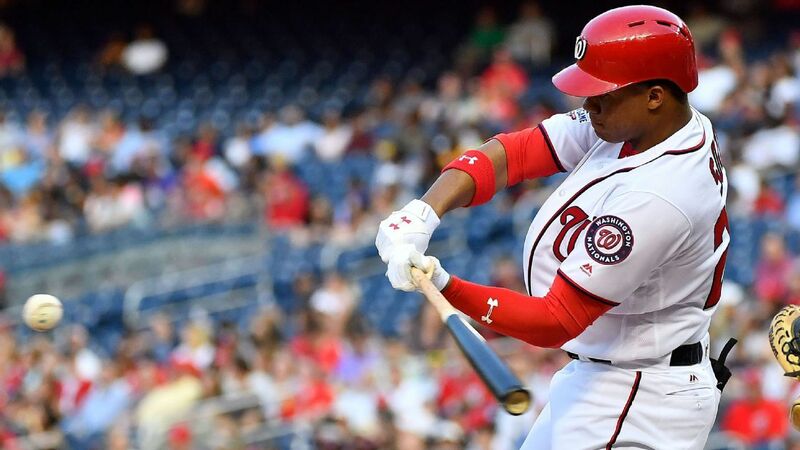 On Monday, Juan Soto made his first start with the Washington Nationals and the outfielder, who is just 19-years-old went yard in his first at-bat versus Robbie Erlin the starting pitcher for the San Diego Padres. Soto’s home run helped the Nationals defeat the Padres 10-2. The three-run home run by Soto to the opposite field came on the first pitch he faced from Erlin. The ball landed over the wall in left-center an estimated 422 feet from home plate. Soto said he did not think the ball would go out of the park and he ran as hard as he could then heard the noise of the crowd and knew the ball had cleared the outfield fence. When he returned to the Nationals dugout, Soto was given a curtain call from the fans at Nationals Park. Prior to being called up this week, Soto was batting .362 with 14 home runs in 39 games in the minors across three different levels. Despite the numbers, many were surprised when Soto was given the call to the majors, given he only had 31 at-bats in games higher than Class A. However, after Howie Kendrick, Washington’s utility man torn an Achilles Saturday, adding to the injury woes of the Washington outfield, Soto was given the call making in baseball’s youngest player. His ascent was so sudden to the top level that as of Monday his locker did not even have his name plate above it. However, he was able to stand out right away. During batting practice prior to the game, Soto was the only team member who wore a helmet, a choice made by him so he could become accustomed to the helmet that has just a single-flap that is worn at the major league level rather than the double flap type that the minors use. As well as homering in the second inning, Soto singled during the sixth and scored on a triple my Michael Taylor. In his two other appearances at the plate, Soto grounded to short and line to right for outs. Bryce Harper the All-Star and former MVP called Soto a special player. Harper hit his 14th homer of the season in the game, giving him the National League lead. Harper was the last player in MLB to hit a home run as a teen on September 30, 2012. Washington has had to overcome injuries to starter Adam Eaton in left field, reserve outfielder Brian Goodwin and prospects Rafael Bautista and Victor Robles.